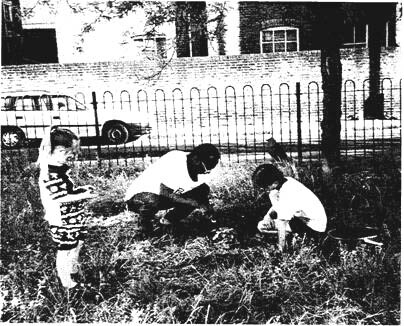 In 1995 it was children between 4 & 16 years old who planted the first community orchard of Green Adventure (see Annual Reports, 1996 & 1997), in a small piece of lawn surrounded by cement in a neighborhood in the south of London, England, that the neighbors used to call "the dogs' toilet". With the naiveté of beginners we asked the Council to let us have this piece of land for a community forest garden, explained to them on one side of an A4 how this fit the criteria for Local Agenda 21 & in a few months we found ourselves there, not only with permission from the authorities but also with a brand-new fence & announcements board, care of the Council, with a dozen of fruit trees & fruit bushes + aromatic herbs in pots brought from the nearby nursery, 3 friends armed with a box of face paints & a few garden tools, to attract the children that passed by, a cold November sunday. In just one morning, each one of those plants was planted by the children who lived right next door, in the run-down council flats, who in this way started to connect with the earth & to learn where their food came from. There are many adventures & touching discoveries that followed during the years after that, that I'll probably never have the time to sit & write about (there are many baby trees to transplant right now in the nursery) & when I returned to visit in 2004, nearly a decade afterwards, in the middle of June, we filled our bellies of delicious varied fruit from this beautiful & productive jewel in the middle of cement. 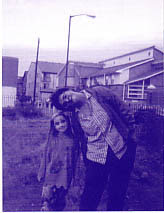 I only regret not having kept contact with those children (they will be young adults now, ¿what do they think of their orchard?) 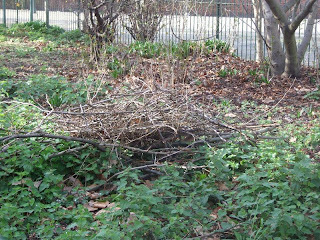 & to not have planted a lot more than the 3 forest gardens in London that followed this one. 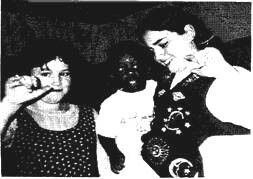 Green Adventure was a charity created by a small group of girlfriends who wanted to bring the ideals of Local Agenda 21 to life in practice, using permaculture principles. 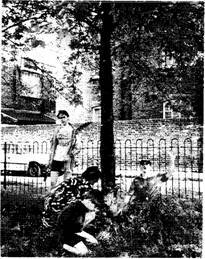 There only remains (as far as I know) this one photograph of the first day of planting this orchard, in Camberwell Green, South London. with faces painted as clowns. 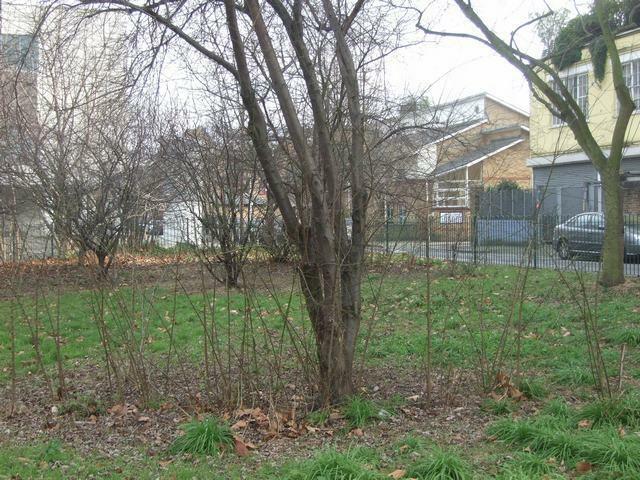 Note the plain lawn behind, but already with fencing care of the local Council, all prepared for our community orchard. 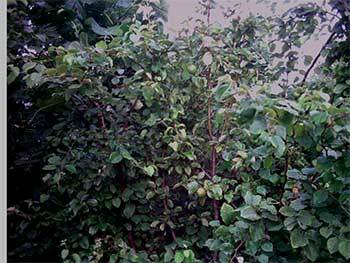 Then these photos below were taken in June 2004, nearly 10 years afterward - during a very quick visit in which two of the founders (Janine & Stella) enjoyed seeing how the orchard had grown ... & we ate of its fruit. ej. a kind neighbor made a wooden bench, another dug a small pond, anyone could plant something. 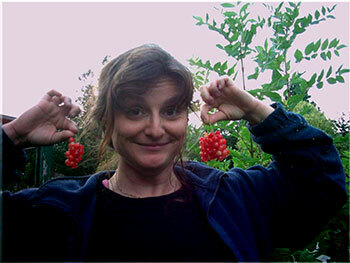 Fruit hedge (gooseberries, blackberries, logenberries, black & red currants, etc. 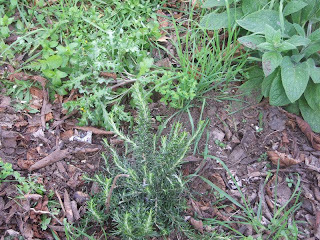 + lavender, rosemary..) hide the metal fence in nearly the whole perimeter - this is the south side. north side: you can see the municipal park in the background, surrounded by roads. 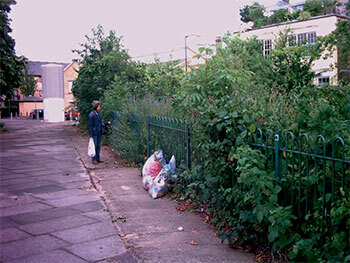 The Community Orchard in front is surrounded by cement tiles on 3 sides, & a road on one side. 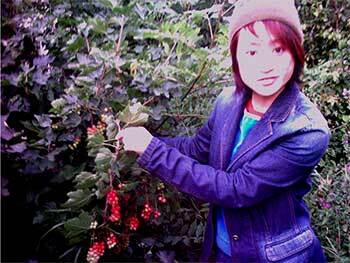 Because when picked & eaten fresh, fruits (especially berries!) 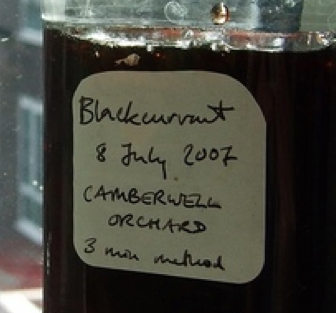 still have all the vitamins & especially the anti-oxidants intact (which help to defend our bodies against city-pollutants), something that shop-brought fruit rarely has, or in much lower quantities. 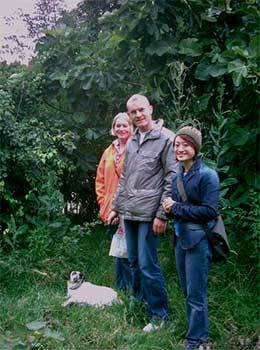 Janine with a local couple who regularly visit the orchard with their dog. they left it only because they moved out of London for a few years ... & they were delighted to know that it still existed (only it had changed offices) ... they were going to re-join, they said. 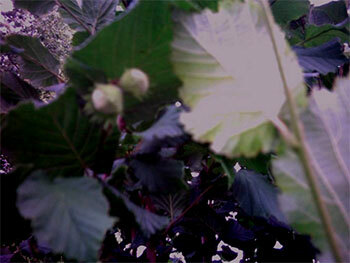 Hazelnuts in the hedge, maturing. The people who pass by this square often throw rubbish &, using the important permaculture principle of "The Problem is the Solution", we transformed this rubbish into money to buy more trees. If you listen to & follow the leadership of children (another permaculture principle "Only go where invited", or "Mini-max"), ie. 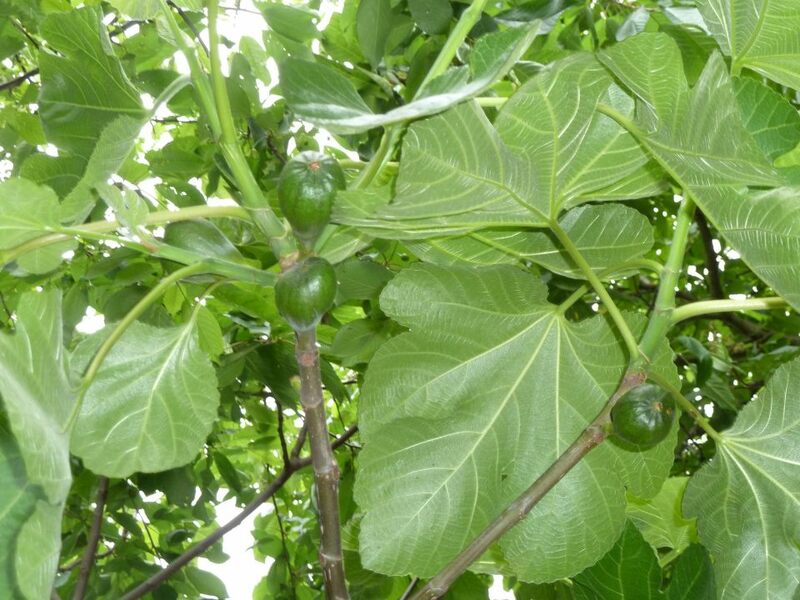 design well, it is easy for the focus of the food forest to generate a whole lot of other activities that are sociable, fun & very educational, with a minimal intervention & some imagination on part of the adults. 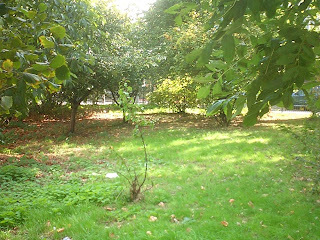 For example, during the first summer of the life of this orchard (1996), the children were quite restless during the holidays & they used to come visit us all hours in the Green Adventure office, which was at some 150m from the orchard & just in front of the flats where the majority of the children who had first planted the garden lived. They wanted to play, talk with us, & especially ... use the computer. In an attempt to get them out of there, we proposed they go take care of their orchard, which was full of rubbish, & we suggested that maybe, if they cleaned it up well we'd let them use the computer a while. 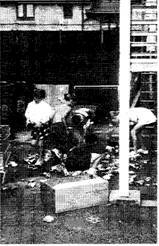 They accepted the challenge & throughout that day fell into a kind of competition amongst themselves, to see who was going to have more time on the computer, by bringing bags full of rubbish to the office as evidence of their merit. In noticing that the majority of the rubbish was in fact tin cans or various kinds of paper, we suggested they collected these separately as we could get payed for tin cans & paper (there was a recycling centre in the square). To follow their game, we started by counting numbers of full plastic bags, then we proposed a LETS* scheme, which is another way of accounting ... from there started a whole project of a junior LETS scheme, because although there was a functioning LETS scheme in this area (& it didn't dis-allow young members), some of the prudent parents didn't much like the idea of their children possibly meeting unknown adults, so we started with the children creating ANOTHER LETS scheme just for them, that however could do exchanges with the adult LETS scheme via a few (trustworthy) adults that could act as bridges between the two. A brilliant idea, & the children had a lot of fun designing their own cheque-books & to use the computer for something very advanced ... to do the accounts! * LETS = Local Exchange & Trading System - a local community club where goods & services are exchanged using a system of 'tokens' (usually equivalent to standard money, time or some other measure) & so by-passing the need for scarce money, whilst keeping 'favours' balanced. 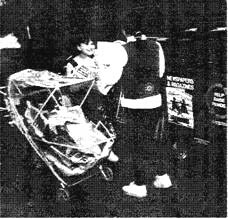 There was no more than 20 children in total, & not all came by at the same time, but all were of various ages between 3 & 13 - the older siblings bringing their younger brothers or sisters in buggies or in arms: it was normal for these very low-income families that the children take care of the younger ones whilst the parents worked all hours. With this style of junior LETS scheme we didn't get any further than designing the cheque-books & start doing the accounts of their bags full of recycling in their own currency (which in itself was already a great accomplishment given that it involved explaining some basis of the local economy that the great majority of adults have no idea about! ), but it would have needed more adult support in order to develop further, we had no funds to work with children, & our voluntary efforts couldn't cope with any more. 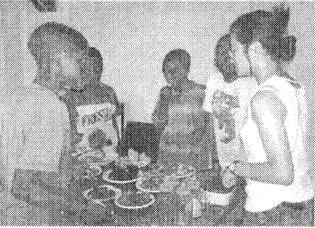 But the recycling project (in exchange for 'real' money, given to the charity by the recycling agencies, which we allocated to plants for the orchard) the children took very seriously &, with an impressive professionalism, throughout that first summer they self-organized announcing to their neighbors that every wednesday they were coming to collect door to door, all tin cans & newspapers. So every wednesday, with no reminders on our part, we regularly got a group of children arriving at the office in all kinds of ingenious types of transport full of recycling (baby carriages, bycicles, supermarket trollies ...). When we had lots of tin cans, we used to throw them all on the floor & jump on them to compact them, & soon behind our space there were enormous piles of newspapers & magazines. We were very proud of them: under their own initiative they educated their families & neighbors with the habit of separating rubbish, & on top of that they did a priceless exercise in community leadership. 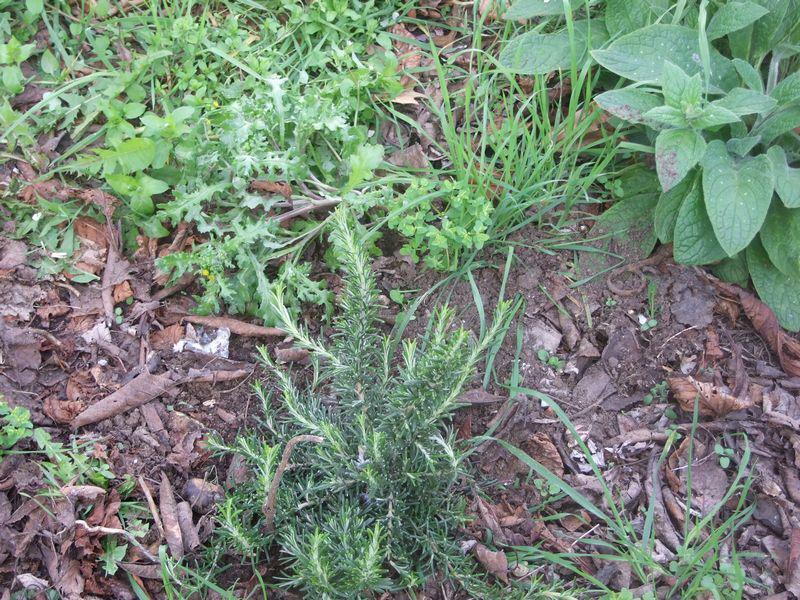 Even so, the most touching thing was seeing city children getting their hands in the soil for the first time, planting things & then bringing their friends & saying to them: "look, you can eat this, it's good" & offer leaves of some herbs that they had never known before ... I still get goose-pimples when I remember those moments. In particular I remember one of the smallest children running into the office looking a little scared one day, shouting that there was something very strange on the fence of the orchard. I asked him to bring it in & he returned with a bean pod (we had planted beans around the fence so they could climb up it). He didn't know what it was & with it's 10+cm it seemed to him like some little monster. 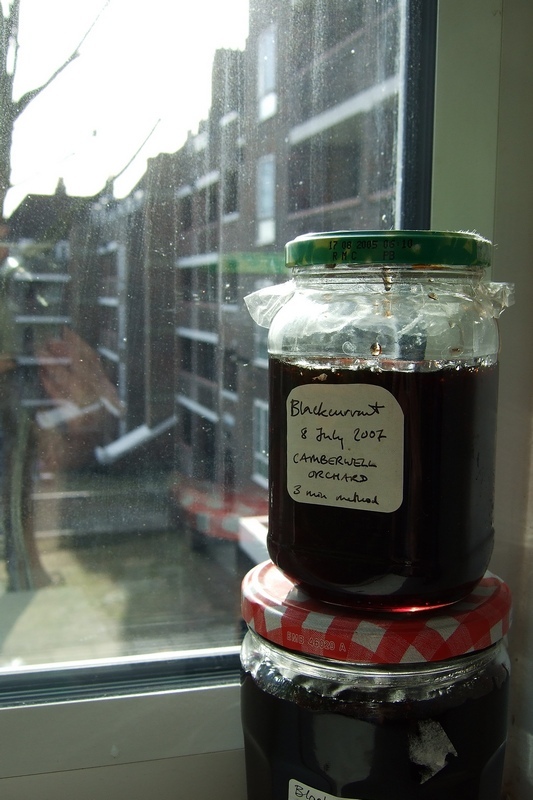 I opened the pod & showed him the beans inside, saying that maybe he ate these every week, but that they started like this, growing up from the soil ('baked beans' or beans in tomato sauce in tins, are a cheap & nutritious food quite common in England). He didn't believe it. There were many moments like this. Like the 4 year old girl who, after deciding for a long time which tree she wanted to plant (all had labels with photos of its' fruit attached), she asked us where she could plant it. Because for us a fundamental design criteria of this orchard was that the participants really take ownership, we did not pre-plan anything as detailed as where to place the plants but rather let each person decide. 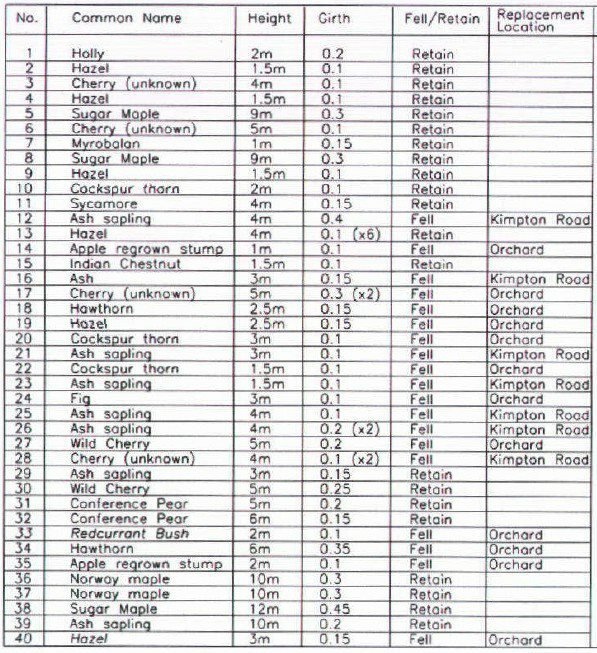 Lots of small miracles created & maintained this orchard. It was easy, a whole lot of fun & very, very moving. 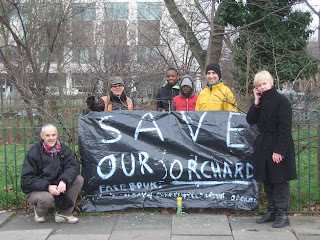 Thankyou to the Save Camberwell Green Orchard group for their persistent vigil & hard work in preserving this precious natural site for the community, in the face of the local Council's unsustainable planning practices (here contrasted very well with it's planning policies). 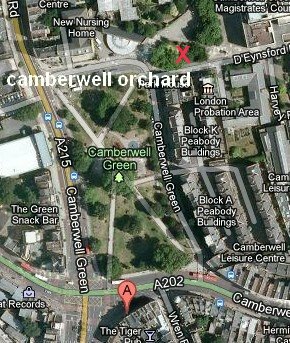 The Save Camberwell Community Orchard Campaign wish to object to the proposal to bulldoze our community orchard and replace it with a library. We wish to see this precious tiny piece of nature protected, whilst supporting the provision of a new library in the area on an alternative site. 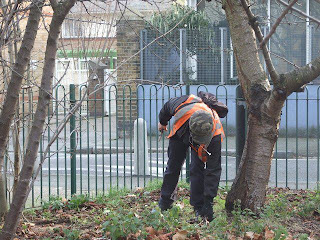 Southwark’s Core Strategy commits the borough to protecting our environment and natural resources. 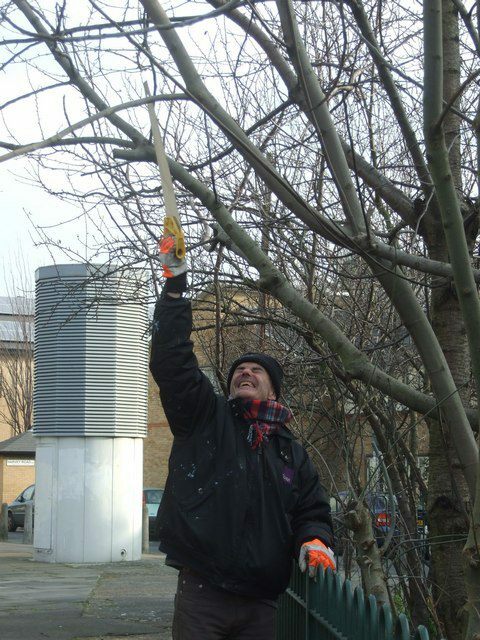 Bulldozing and building on one of the only mini community orchards in the borough does not protect natural spaces. None of the consultations offered local people the option to saying where they would like their new library to be located. Asking people what they would like in a library rather than where they would like it located is not effective consultation. Despite location not being one of the questions asked of the community, the majority of those replying objected to the bulldozing of the orchard and the building on this site (53%) – with only 28% supporting building on this location. 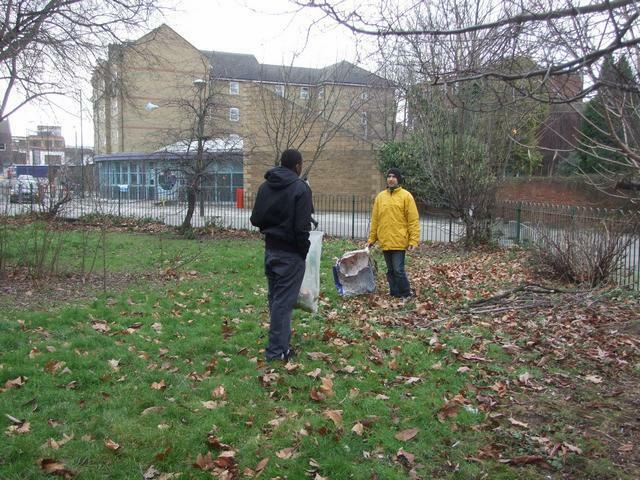 A deputation to the local Community Council successfully got them to agree to consult on alternative locations. This never happened. Consultees at one of the consultation events were provided with false information stating that the site’s trees had “self planted” when in fact the orchard had been planted by local children in conjunction with the local charity Green Ventures. This proposal by building on and enclosing the only public open space squares in Camberwell, does the opposite of the creation of liveable public realm – it destroys it. 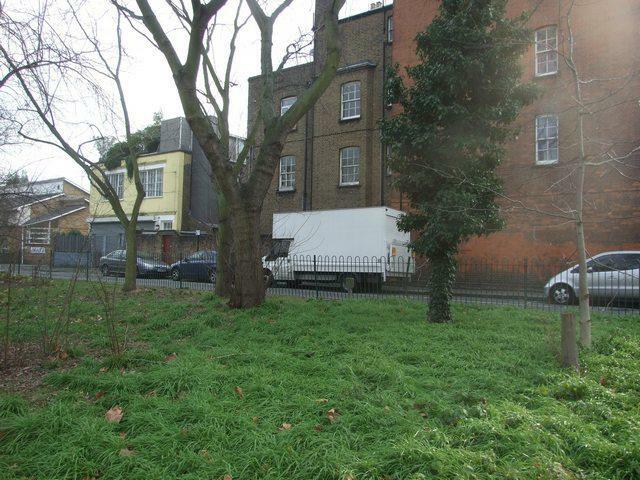 It also turns the approach to the Elmington Estate from one that is beautifully tree-lined and semi-natural and spacious into a narrow threatening built inner-city lane. Bulldozing one of the only and earliest community food projects contradicts this policy. The orchard helps to provide a green corridor from Camberwell Green towards Burgess Park. 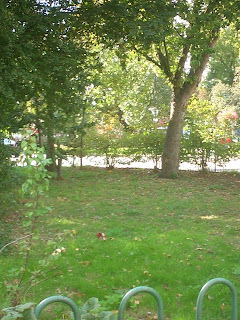 The orchard being the only clump of trees planted in semi-woodland style in the area of the Green makes an important contribution to the overall greenness of Camberwell Green. In the busy polluted hub that is the major traffic junction of Camberwell Green, the court-house plaza is one of the only such places in the neighbourhood. 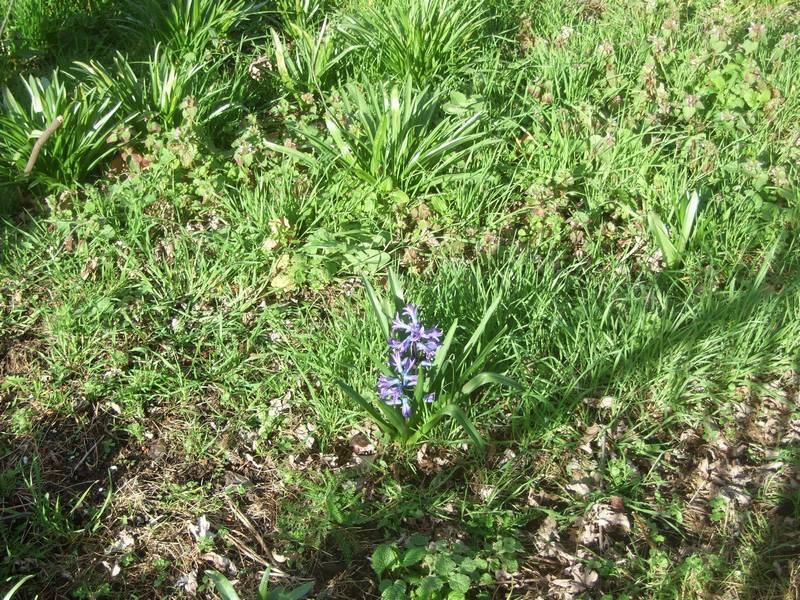 Your ecological survey states that the site provides nesting sites for local birds, it all has the only woodland floor flora in the Green with a beautiful display of wild garlic and bluebells every spring. The site is visited by numerous types of song birds and local squirrels. As it is the only final few square meters fenced off from human intervention in the Green, makes it the almost sole site of value for local wild-life and biodiversity in the Green. As this is the only food-producing site in the Green, you are contradicting this policy. 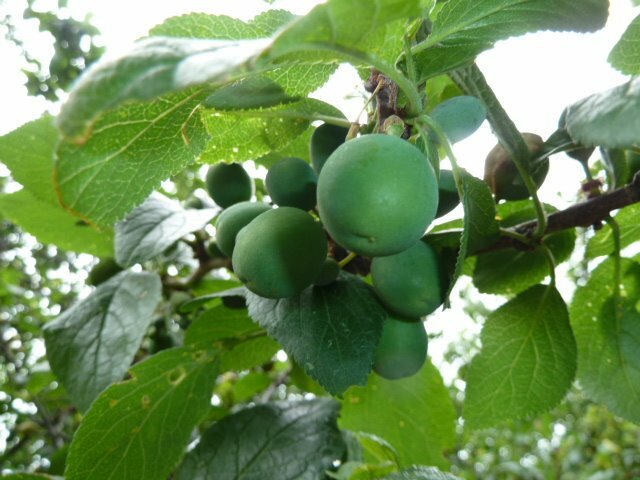 The fruit trees are now producing well over a thousand plums and pears per year. 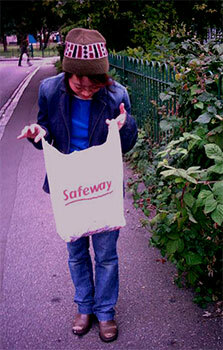 These were collected and distributed to local pensioners and members of a local environmental transition group in 2012. 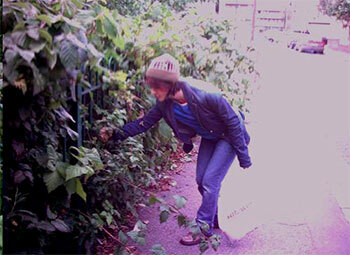 The Camberwell Green Community Orchard Campaign organised 3 community litter picks in 2012. 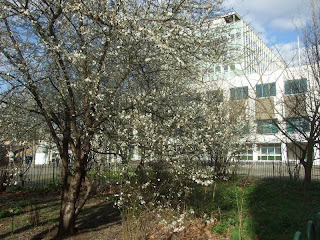 The orchard is now almost fully mature with a beautiful spring blossom and woodland flower display this spring (2012). 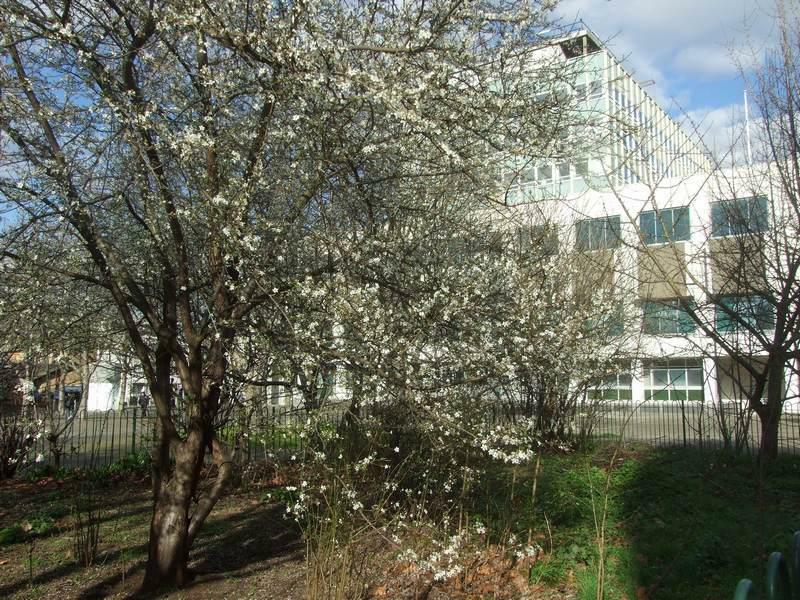 The Court House Plaza and Camberwell Green Community Orchard are a natural part of the Camberwell Green Open Space and are included in the geographical remit of the Friends of Camberwell Green. 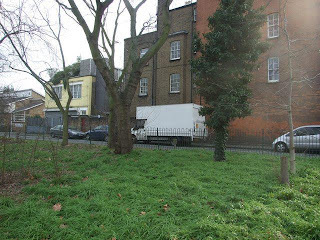 The building on the green contradicts the Core Strategy commitments to protecting valuable open space but also the adopted Open Space Strategy with identifies the Camberwell Green area as one of the most lacking in public open space in the Borough. This will be further aggravated by the proposals to building thousands of new homes in the immediate vicinity of the Green. Rather than building on this precious resource the council should instead recognise it for what it is – an amenity that is as valuable to the fast expanding local population as a good quality local library. It should not be seen as either/or but as both are possible and valuable to local quality of life. We therefore would like to see the Courthouse Plaza and Community Orchard to be included in the proposed plans for Camberwell Green and instead of being destroyed, should be enhanced by their integration into the Green itself. 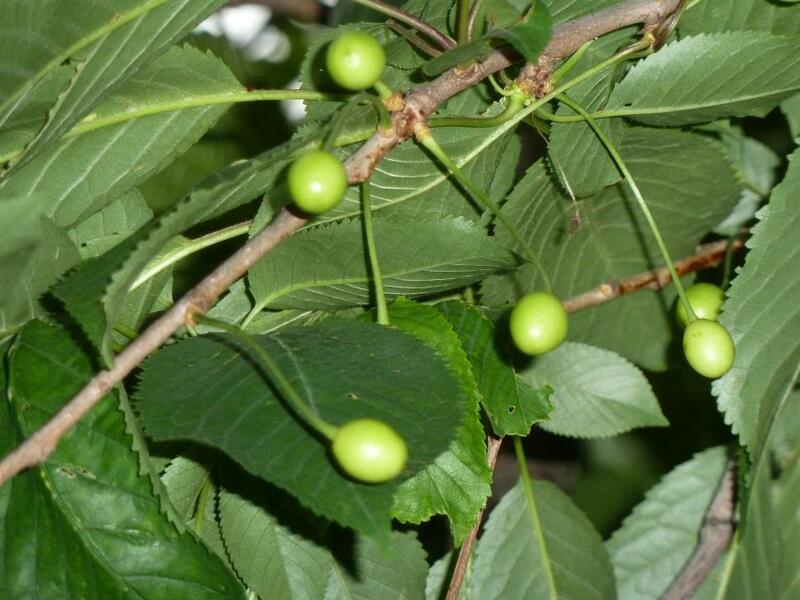 We attach our petition with over 200 signatures protesting against the loss of our community orchard and hope that you will agree to protect our little local green gem. We would also councillors to also look at some of the moving personal statements made in the petition by many of the signees. It demonstrates powerfully the emotional value so many local residents attach to this one of the last remnants of nature in our neighbourhood. 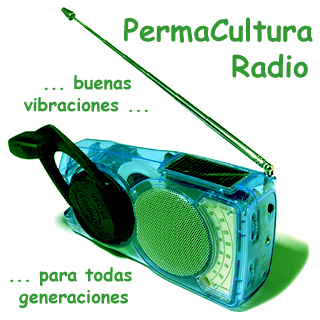 Article originally written in Spanish by Stella (in August 2008), one of the Green Adventure founder members. "The fruit trees are now producing well over a thousand plums and pears per year. 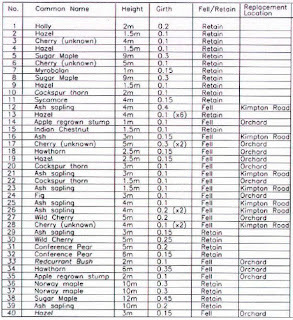 These were collected and distributed to local pensioners and members of a local environmental transition group in 2012. The orchard is now almost fully mature with a beautiful spring blossom and woodland flower display this spring (2012)." 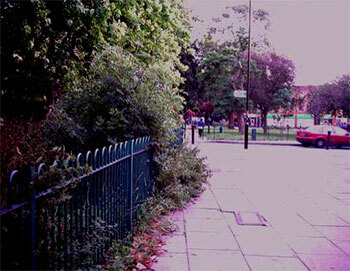 Just back from inaugural meeting of Friends of Camberwell Green. 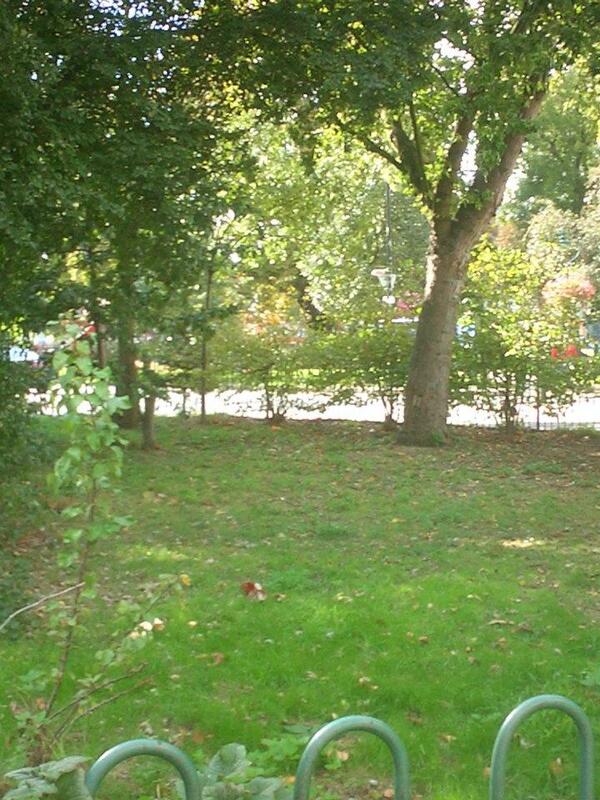 I managed to get a commitment to nature conservation and protection of open space of the green into the objectives. 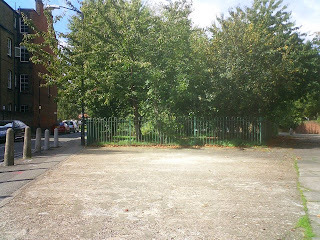 I nearly got into the objectives that we were committed to the open space nature of the green and magistrates court plaza but then one person (I think from SE5 Forum?) interrupted and it was watered down to delete the named mention of the plaza. I then asked that they oppose the building of a library on the associated open space in front of the Magistrates Court - nearly everybody agreed but for 3 people - who argued "we needed more information" " a library would bring more people to the green". "trees can be replanted"
Nearly everyone else there were very positive about saving the orchard but most were unaware of meeting dynamics... but those who want to bulldoze the orchard for the library were very meeting savvy. thanks Penelope, Liliana, & Donnachadh for the great photos! Like there's not enough concrete to put a library on, all around this? So sad when there's more money than imagination floating around, & it's used to destroy instead of build intelligent structures.